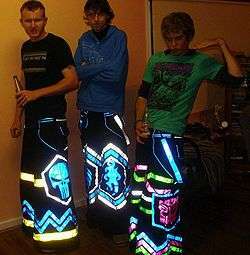 Phat pants worn by ravers in Australia. Phat pants, phatties, or phats are a style of pants that are fitted at the waist, but get increasingly wide down the legs, covering the feet entirely due to their width. Phat pants can be made out of a variety of materials, however denim, faux fur, and cotton fabric tend to be the most common. High-end customized phats tend to include UV reflective tape decoration to add a glowing effect. Phat pants are notable for being a visual identifier of those within the rave community. Popular makers of phat pants include Kikwear and JNCO. Phat pants rose to popularity in 1995 within the kandi kid community of ravers. Also called B-pants, the trend regained attention in the wake of the 2010s in the form of snowboard pants. ↑ Breen-Burns, Janice (2005-08-27). "Rave reviews". The Age. Breen-Burns, Janice (2005-08-27). "Rave reviews". The Age. Klein, Sarah (2000-12-19). "Killer outfits". Metro Times. "Talking with Alex Berenson of Kikwear". Spreaker Blog. 2013-11-23.